Our primary goal is to provide the highest quality care possible to all of our patients. Our providers were trained at world-class academic medical centers, and all of our doctors maintain board certification in Gastroenterology (GI) through the American Board of Internal Medicine (ABIM). Our office is certified by the Accreditation Association for Ambulatory Health Care (AAAHC). We treat every GI condition and offer comprehensive GI services. We have used a robust electronic medical records system for almost 10 years. We are proud of our longstanding relationship with Sentara Virginia Beach General Hospital and our ability to provide continuous care between the hospital and our office. We use only state-of-the-art endoscopes with high-definition monitors and advanced imaging. We have continuously tracked the quality of care we provide for many years. We ask every patient seen in our office to complete a survey about their experience. Over the past several years, 98% of patients seen for an office appointment rated their overall satisfaction as excellent (85%), better (8%), or good (5%), and 99% of patients who have an endoscopic procedure (endoscopy and/or colonoscopy) in our office said they would return again if they needed these medical services. A major focus of our practice is colon cancer prevention. Colonoscopy is currently the primary tool for decreasing colon cancer risk, and high-quality colonoscopy is highly effective. Colonoscopy prevents colon cancer by allowing the gastroenterologist to remove potentially precancerous polyps called adenomas. The more adenomas a colonoscopist detects and removes, the fewer cancers will occur in his patients. The American Gastroenterology Association (AGA) has set benchmark adenoma detection rates of 20% in women and 30% in men for screening colonoscopy. At Gastroenterology, Ltd., we have been tracking quality measures for colonoscopy for many years. 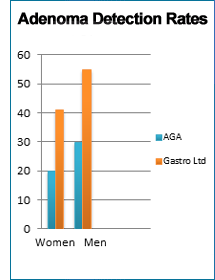 All of our gastroenterologists consistently exceed the AGA benchmarks, and in 2015 our overall ADR for screening colonoscopy was 41% in women and 55% in men. We are very proud of these remarkable numbers, and we share them with you and our patients as a testament to the quality of what we are doing at Gastroenterology, Ltd.